Idle talk. Rumor. About private lives. Who enjoys what is so obviously a vile and worthless act? Well, apparently many of our fellow humans do. Many of the same people that are all-too-willing to pontificate about superior intelligence and all that. And make no mistake, gossip is worthless and it is vile. It’s worthless in that it accomplishes nothing and vile in that such behavior is abominable. Despite this, many of us engage in, and even encourage the act. The latter is evident mostly through the much of the media produced, and what many people choose to consume. Think about all of the mindless television (e.g. ‘The Bachelor/Bachelorette,’ ‘The Kardashians,’ etc.) that emphasizes gossip to attract viewership. Relatedly, we have “news” outlets like TMZ that feast off the public’s insatiable desire to get the “latest scoop” on (often false and derogatory) information that has absolutely nothing to do their own lives. Granted, the instinct to gossip can be tempting. This is especially true if there is some sort of individual vendetta against someone else. Additionally, a typical and neutral conversation about someone can quickly become a gossip session if someone if someone within a group decides to interject with some “juicy tidbit” about another. While it can be tempting to take part in such a “discussion,” it is often a bad idea. “Guilt by association” is a particularly relevant phase in such a scenario. Perhaps some of us can related to having “known” about someone or something when we had such knowledge. How did this feel? Probably not very good. In any case, people who gossip often do not feel good about themselves. For example, some gossipers feel unwanted or uninteresting, and may choose divulge something that can arouse interest. In doing so, these people may feel a sense of acceptance and comradery. Such people often have one of two feelings: either relief at being accepted, or remorse for having hurt someone else. Unfortunately, it is all-too-often the former. 60 percent? Why such a high number? The reason that psychologists gives is that gossip helps to build social bonds. The reason? Because the dislikes shared between groups of people is more powerful for human bonding than shared likes and other positive information. 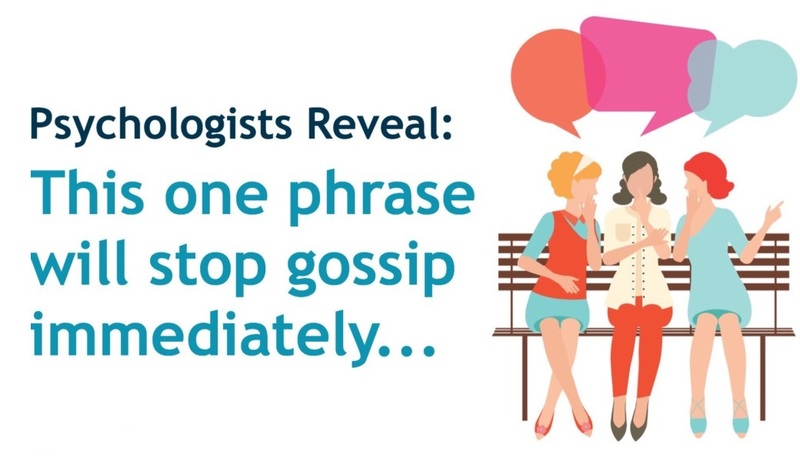 People engaging in gossip often feel a shared sense of humor, mutual interests; not to mention a certain “thrill” achieved through divulging “confidential information” (i.e. the “bad stuff” about someone else). Many gossipers revel in the failings of others, and some take pleasure in the misfortunes of other people – even if such pleasure is warrantless at best, and devious at worst. When someone is trying to involve you in an offensive diatribe relating to someone else, the best thing to ask is: Why are you telling me this? Psychologists say that this is effective for a couple of reasons. First, the question immediately disrupts any self-serving motive from the gossiper. Second, the phrase forces them to face the fact that you’re probably none-too-happy about being involved. This effective response aside, social psychologists and other experts share one simple pearl of wisdom: refrain from starting any dialogue that about a person that they would likely be hurt by – emotionally or otherwise.